This composite image shows M84, a massive elliptical galaxy in the Virgo Cluster, about 55 million light years from Earth. 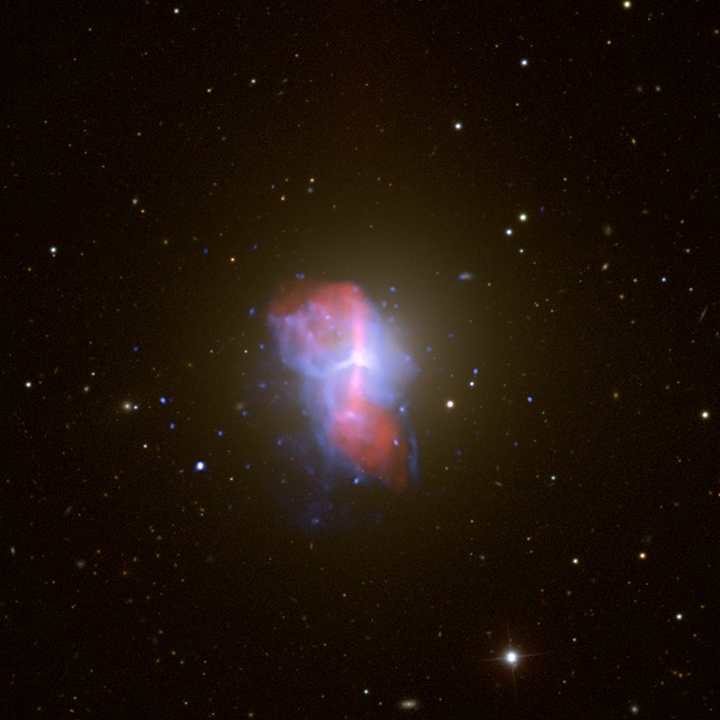 Hot gas around M84 is shown in a Chandra X-ray Observatory image in blue and a radio image from the Very Large Array is shown in red. A background image from the Sloan Digital Sky Survey is shown in yellow and white. 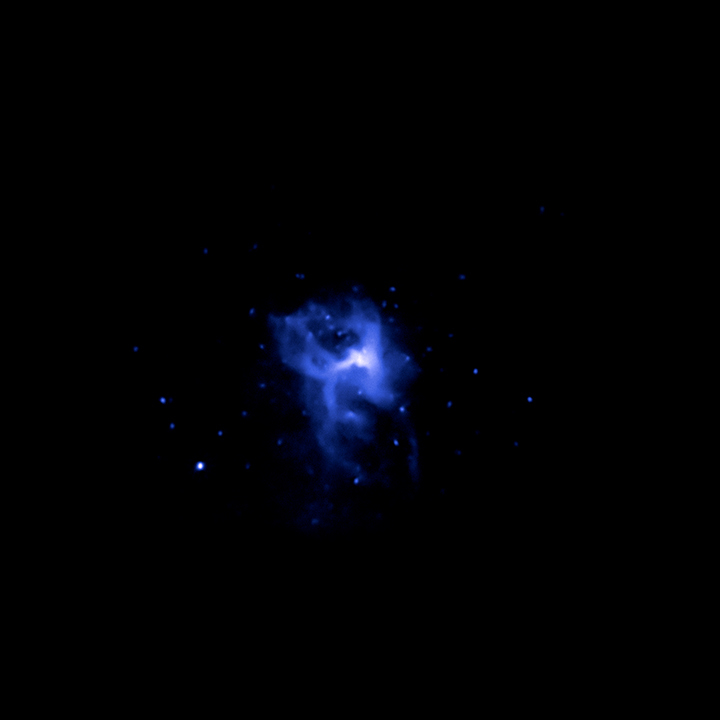 A number of bubbles are visible in the hot gas, outlined with blue X-ray emission. These bubbles were blown by relativistic particles generated by the central supermassive black hole in M84. These particles travel outwards in the form of a two-sided jet. Because smaller bubbles are found inside large bubbles, the impression given by the image is that of Russian dolls, where smaller dolls can be found inside large ones. These nested bubbles provide clear evidence for repeated outbursts from the central black hole. Supercomputer simulations of the interaction of supermassive black holes with surrounding gas can explain how such "Russian dolls" are created. The simulations reveal the nested bubbles associated with the termination of the jet and their complex interaction with the surrounding gas, somewhat similar to the effervescent bubbles in a glass of champagne. The dissipation of energy by sound and shock waves generated by these outbursts, as well as the additional motions they generate, are believed to be heating the gas surrounding M84. This slows down the cooling of the gas and suppresses the formation of new stars. Unless a black hole experiences a single but extremely powerful episode of activity, multiple outbursts are needed to suppress the formation of new stars and to maintain a balance between cooling and heating over long periods of time. The observations also show that the top bubble is bursting and the hot relativistic gas, shown in red, is spilling out to the surrounding medium. The mixing of this hot gas with the cooler gas in the galaxy is an additional mode of heating of the surrounding gas by supermassive black holes that has not previously been seen so clearly. These results address a larger question of why galaxies stop growing after reaching a certain mass, despite containing large quantities of gas that can potentially cool and form new stars. If uninhibited, such cooling process would lead to the formation of many new stars and much bigger galaxies than are observed. Outbursts generated by supermassive black holes like those in M84 provide at least one explanation for this lack of "mega-galaxies". Alexis Finoguenov of the Max-Planck Institute for Extraterrestrial Physics and University of Maryland, led this study. The co-authors are Mateusz Ruszkowski of the University of Michigan, Marcus Bruggen of Jacobs University in Bremen, Germany, and Christine Jones, Alexey Vikhlinin and Eric Mandel of the Harvard-Smithsonian Center for Astrophysics in Cambridge, Massachusetts. Scale Image is 9 arcmin across. Coordinates (J2000) RA 12h 25m 03.743s | Dec +12° 53´ 13.14"